H&R Block thinks personal finance education is so important, They're paying people to learn. You may recall a previous post of mine from early September 2014, where I shared a terrific program put out by H&R Block. Well, another session is coming up and I want to remind my readers about this great opportunity. Everyone knows money doesn't grow on trees. At least they will if H&R Block has any say in it. By learning strong budgeting skills and fiscal discipline early, kids can gain the knowledge and confidence to manage their own financial future. The free H&R Block Budget Challenge encourages students to learn personal finance in a fun, engaging way while competing against other classrooms and students for $3 million in classroom grants and student scholarships. 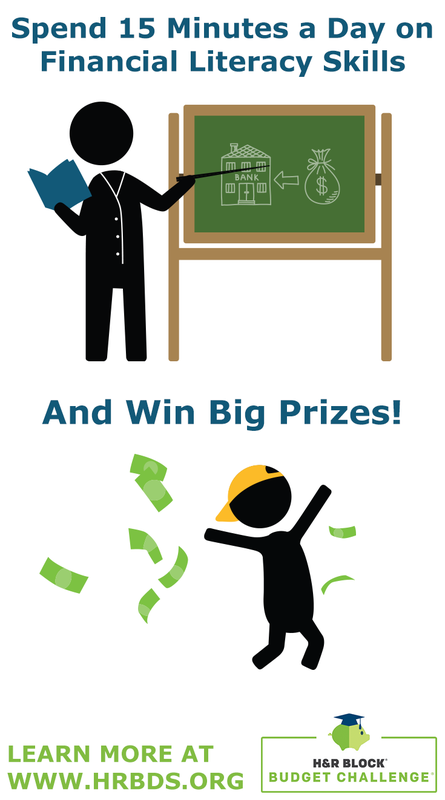 THE H&R BLOCK BUDGET CHALLENGE Is fun, free, and students love it. Participants encounter real-world personal budgeting situations, problem-solving, and decision-making through an online simulation and accompanying lessons that meet national standards. With sessions October through April, teachers have six opportunities to participate. The Budget Challenge is open to students 14 years of age or older and enrolled full-time in grades 9 through 12. Teachers must register classrooms to play The Budget Challenge. Teachers simply visit hrbds.org to begin the classroom registration process. Registration closes one week before the simulation start date, so be sure to sign up before it's too late. Read the FAQs here! "My kids love this challenge. Everyday they are engaged and want to learn more about personal finance—and, more importantly, they are becoming more financially literate." "I must thank you for the wonderful resource this simulation is and how useful I'm sure it is going to be for their future financial success. They are checking on their status in class all the time, even when it isn't our scheduled activity. Those who have downloaded the app have found it incredibly useful and convenient as well." My Juniors and Seniors do this for a Project grade every Wed. and Fri. We have a good time with this "bonding" experience and there is great laughter as well as dread when they have late fees! I really appreciate the people who put this challenge together. It is wonderful to witness them learning about "real life!" "The Personal Finance teachers at our school have incorporated this simulation into our daily class procedures. The students (and teachers) love the real-world components and valuable lessons to be learned. We are very grateful to have this free resource to help students better understand financial responsibility." "I am so thankful that you guys have put together such a wonderful curriculum for teens. Every time I am out and someone asks what I do and I tell them I teach financial literacy to teenagers they all say "I wish they had that class when I was growing up." Thank you for everything you do!" I hope you will participate and share the information with others who may be interested as well.